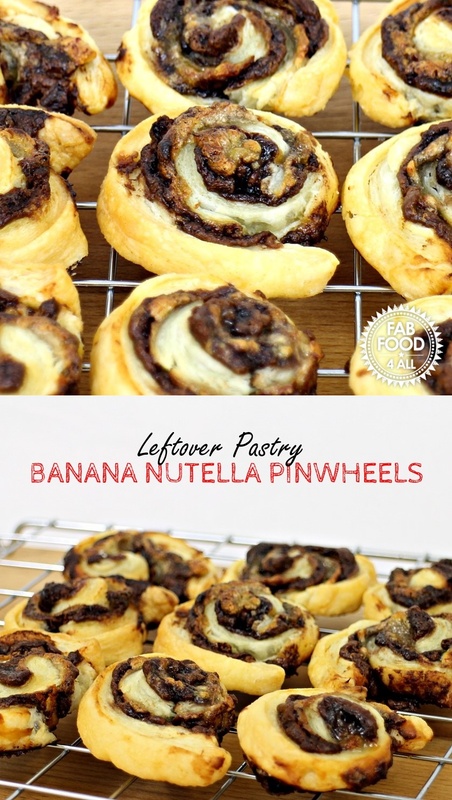 Today I’m bringing you Leftover Pastry Banana Nutella Pinwheels! My favourite way of making quiches is with puff pastry and I always have some left over. Often I’ll make some extra egg mixture to make mini quiches for the children’s packed lunches or maybe do some cheese straws. The other day though I decided I would make some peanut butter and jam pinwheels I’d read about in The Guardian. I always have peanut butter in the house and was really looking forward to doing something different with my leftover pasty until the store cupboard let me down! Someone had eaten all the peanut butter (it wasn’t me, honest) most likely my son so I was left scratching my head as to what to make instead. Whatever it was, I wanted it to be ultra quick and easy as I wasn’t in the mood for fuss and fiddle. I looked in my cupboard and saw the Nutella staring back at me and then a sideways glance at the fruit bowl offered up bananas. Ha, ha, I thought, I wonder if they would work? Well about 25 minutes later out from the oven came the cutest little pinwheels (yes they are definitely finger food, not Danish pastry size) and the smell was just divine. My family happily tucked into these Leftover Pastry Banana Nutella Pinwheels after dinner and my daughter asked why I hadn’t used all the pastry up to just make them. They really are fabulous and the banana adds a gooey texture a bit like the custard in a Danish pastry whirl. These pinwheels were never intended as a blog post but when they tasted so good I hastily took a few quick shots! 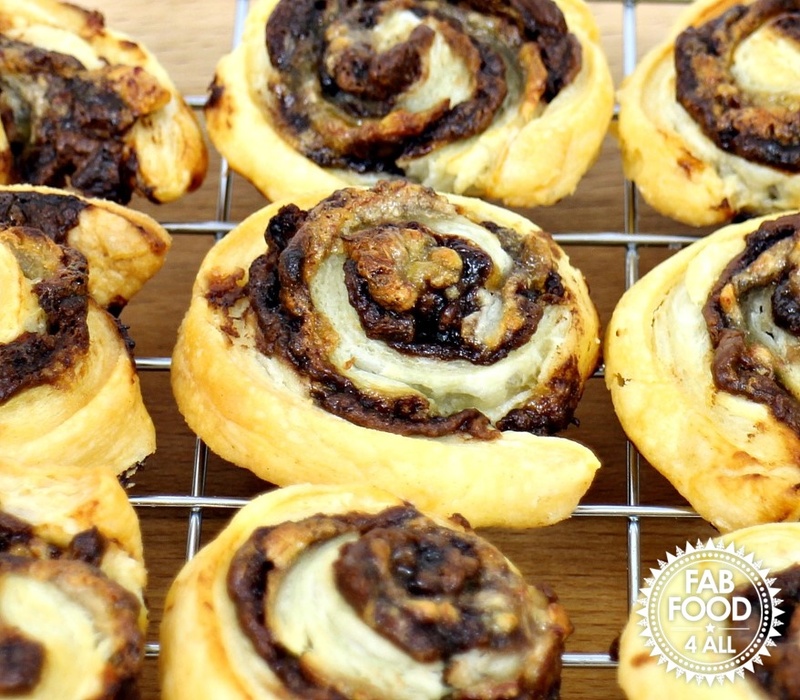 So if you have a bit of puff pastry left over and fancy a little sweet treat with a cuppa then I urge you to make these pinwheels. You don’t need to fuss over exact measurements and you’ll probably only need half a mashed banana but I happily ate the leftovers. Credit Crunch Munch which I run with Fuss Free Flavours and hosted by Baking Queen 74 this month. 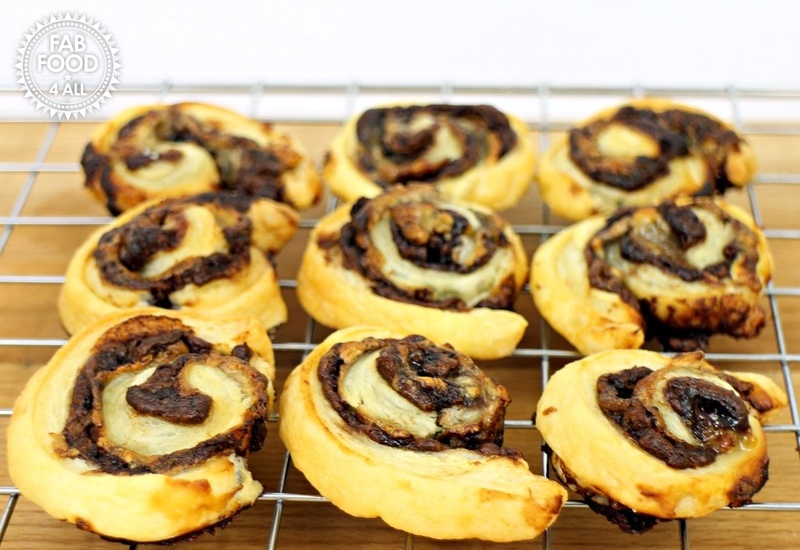 Treat Petite where the theme is Eurovision and as I’m half Danish and these pinwheels look like miniature Danish pastries I’m entering them – oh and I’m the biggest Eurovision fan going to I just had to enter – run by Cakeyboi (who is hosting) and The Baking Explorer. No Waste Food Challenge run by Elizabeth’s Kitchen Diary. 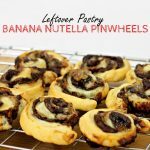 A dainty Puff Pastry Pinwheel flavoured with Banana and Nutella - so quick and easy to put together and so delicious! Roll the pastry out to a thickness of about 2mm (like in a pre-rolled sheet), don’t worry about a neat shape, mine looked like an amorphous blob! Slather on a thin layer of Nutella. Then spoon on the mashed banana for form a thin layer too. Cut the pastry into strips, roughly 1cm wide or slightly more. Gently roll each strip up and place on a baking sheet lined with baking paper. Brush each pinwheel with egg wash.
Bake for about 20 – 22 minutes until baked through and golden. This timing based on lengths of about 13cm if shorter lengths used decrease the baking time or if longer you may need to increase. How yummy do these look! I need to acquire some left over puff pastry! Or I’ll get some out of the freezer. Great idea. My Mum does a similar thing, but with mincemeat as an alternative to mince pies. Thanks Elizabeth, I also tried it with the peanut butter and jam which inspired me but this varient was horrible and non of us like it! Wow, I have a feeling my kids would love these!